Summer running in the city of Los Angeles: Extra tourists on the roads (and the sidewalks!). Tons of fun construction for spontaneous detours! Heat index on the rise! Extra smog just to add to the fun! Yeah. It’s not exactly the great outdoors, and it almost (almost!) 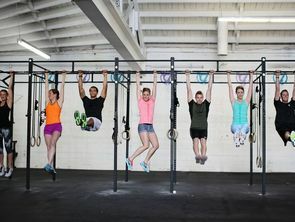 makes an indoor treadmill look appealing. Luckily, one of the benefits of living in the City of Angels (or so we drop every time we chat with a New Yorker) is that you’re within a short drive to both the mountains and the sea, in fact! So, with a long run on my training schedule and a Tuesday off, I took advantage of my nearby surroundings to take a “Run Worth the Drive” that incorporated both. 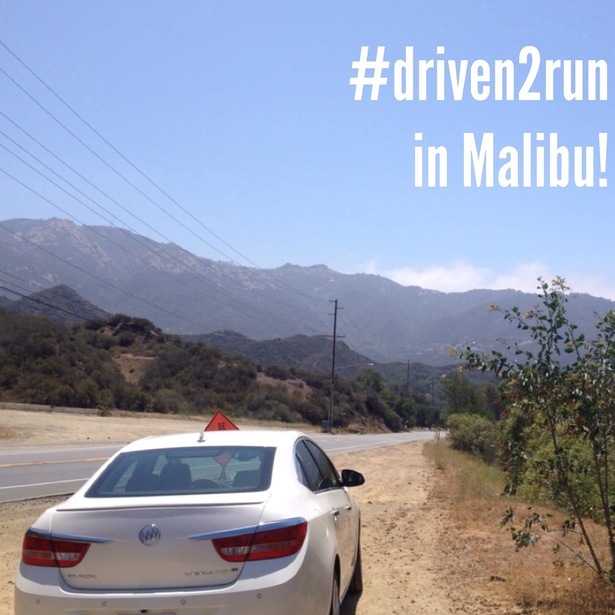 Keys to a super comfy Buick Verano in hand, I began the trek to Malibu. The PCH was as congested as ever, but the promise of a long canyon run followed by some ocean side jogging provided the necessary motivation (that, plus the air conditioned ride and the Pop2K station on the Verano’s Sirius radio). I don’t make it out to Malibu all that often, so when I do I’m going to make the most of the day. Hence, the first detour: a class at the uber-Malibu Juicy Athletic Moves, which I had been dying to try. Perhaps I should have separated the hour and a half intense cardio class from the long run ahead, but what fun would that have been? Already sweating, and sufficiently warmed up, it was time for the run. Tucking my car away safely off the road, I started on a downhill toward the sea. In retrospect, perhaps a good life strategy is to get the tough, uphill part over with first, but life strategy wasn’t on my mind as I glided downhill along Puerco Motorway and Puerco Canyon Road. “Running is easy!” was actually the mantra going through my head. Running is not easy. After my downhill and straightaway along Malibu Road quick stop on the pier to take photos, it was time to head back. With 8 out of the 13 miles down, my confidence was high. My short-term memory, on the other hand, was quite low, as I had forgotten the elevation where I started…and where the car still waited for me. Even a quick juice stop at the Pressed Juicery truck (detour #2) couldn’t quite push me up that last hill, which ended in a bit of walking. 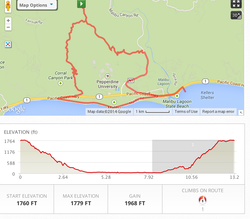 But 13 miles is 13 miles (or 13.2, as I later mapped out on MapMyFitness), and I had totally earned the comfy ride back. The only thing the car was missing was a massage option in the driver’s seat (look into it, Buick! ), but the AC and Pop2K were just fine by me. So was a post #Driven2Run nap, which was well deserved after the day of exercise. 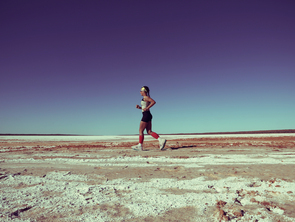 Whether you’re a LA local or find yourself in another metropolis, summer provides the perfect time to get the heck out of the urban scene, and go for a run worth the drive. 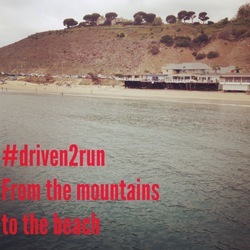 Where are you #Driven2Run? Sign up for the Buick Challenge here. Note: General Motors supplied the sweet Buick Verano mentioned throughout the post.